The South Korean central bank spent 32.4 billion won to replace the damaged banknotes over the first half of 2018, up from 31.2 billion won recorded six months earlier. That news comes despite both the volume and face value of damaged banknotes falling slightly over the same period, the central bank said. 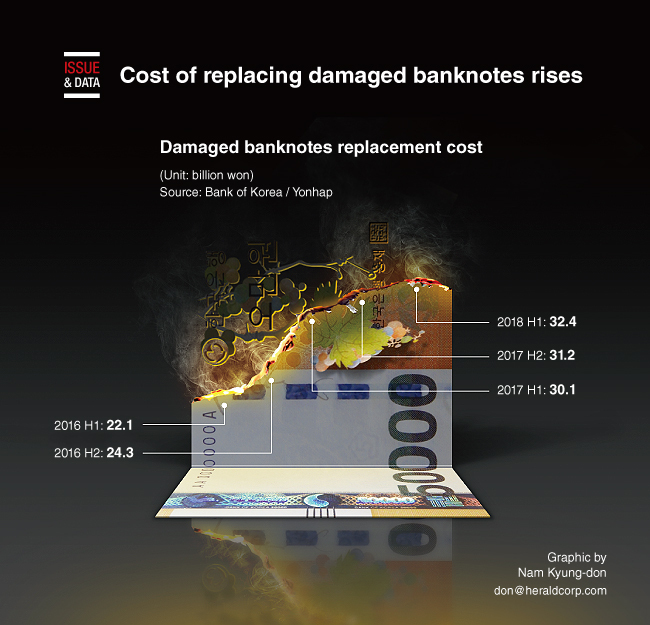 In the January-June period, the face value of damaged banknotes discarded by the Bank of Korea came to 2.02 trillion won ($1.79 billion), down 1.9 percent, or 40.2 billion won, from the second half of 2017, according to the BOK. In the first half, damaged bills accounted for 99.9 percent of the total, in terms of face value, while the combined face value of damaged coins only came to 1.12 billion won. Out of the total, 1.58 trillion won worth of 10,000 won bills was disposed of in the six-month period, with damaged 50,000 won notes valued at 235.5 billion won.